Woven by Words: Get Out Your Sprinkler! When we were building our house, I had a lot of specific things I wanted done to it. I actually have a vision of what my dream home would look like. Well, probably more than one dream home. Probably several. The house we moved into last October is designed very much by me (with the approval of my hubby of course). There were basics on the inside, but I tweaked it quite a bit. We also modified the outside just a tad. One of the things I asked was for two spigots to be placed in very specific areas. The was a reason behind my request: how our house and property were designed. I wanted a spigot on the left side of the house and one to the far right side at the back of the house. The builder put one on the left...and the right, but not the back. Well, ok. Unfortunately, our backyard is larger than our front so taking care of the backyard could be a pain. Thank you for that builder. 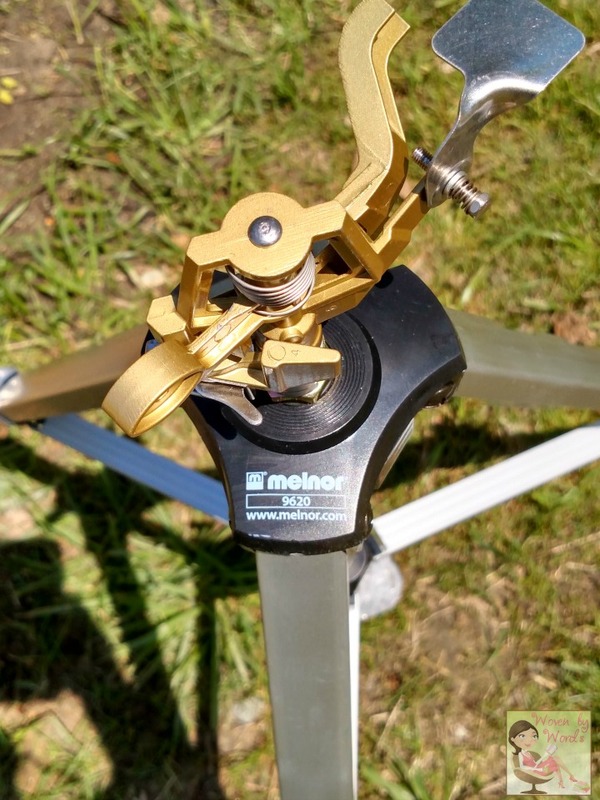 I reached out to Melnor to do a review of one of their sprinklers because they're a local company, and I was tired of being jealous of our neighbor who has a telescoping sprinkler. I had a couple that stick in the ground. Let me just share that the ones you stick in the ground here don't actually go into rock hard clay very well. So, they sent me their Metal Pulsating Sprinkler with Tripod to try out. And then...it rained, for almost an entire month. Since the end of April until this week I think we saw 2 1/2 days of sun. The opportunity to use the sprinkler was absolutely non existent. I'm not sure how frustrating that is when you have reviews to do for things like a sprinkler or bathing suit! Rain = not helpful. There's so much I love about this Tripod! There are two extensions that will take the sprinkler up to 48". It will also water up to a 85' diameter circle. With this backyard, it's exactly what we need. I've played around a lot with the sprinkler portion for the diameters I want sprayed and they type of mist I want. Around my garden I wanted more of a misting pattern. For the grass I wanted a straight stream to get to the farthest part of the yard. Then there's the dog who's completely interested in the sprinkler! I had no idea she'd want to get up close because she's typically a fraidy cat of odd looking things. When she was out back with it one day, she would not stop trying to drink from it, all the while trying not to get wet. She cracks me up. So if I hook the hose to the opposite side of the house, the sprays should meet somewhere in between so that all of the grass is covered! No more fighting the dumb clay ground for this gal! Now, we just have to work the ground to be able to plant grass seed to one day have a decent lawn! Be sure to follow Melnor on Facebook! What a great product. Of course it would rain as soon as you receive it. Mother Nature can be funny like that! That product looks so great! I currently live in the city, so no sprinkler worries for me :) Love that you were able to get all of the ground covered! Followed! We loved our telescoping waterer when we had one. I wish I knew the brand! It looked so much like yours. We have a water system (what I asked for when I built my dream house!) and it does a fine job! What an interesting product! We only have one spigot for our home, and we need to run a lot of hose to get to our yard and gardens. The kids love it though! I've never heard of a sprinkler on a tripod. What a clever idea! And it doubles as a doggy toy haha! When you said sprinkler, I immediately thought this would be a post about kids running through the back yard. Surprise surprise! I loved that you dog seems to enjoy it as much as you do. That is a super awesome sprinkler. My kids would loe running through that one. Sprinklers are a godsend. Mind you trust it to rain when your sprinkler arrives haha! Love this sprinkler. So much neater and better than the ground ones we have. Must have a look for them. I didn't even know that sprinklers like this one existed. 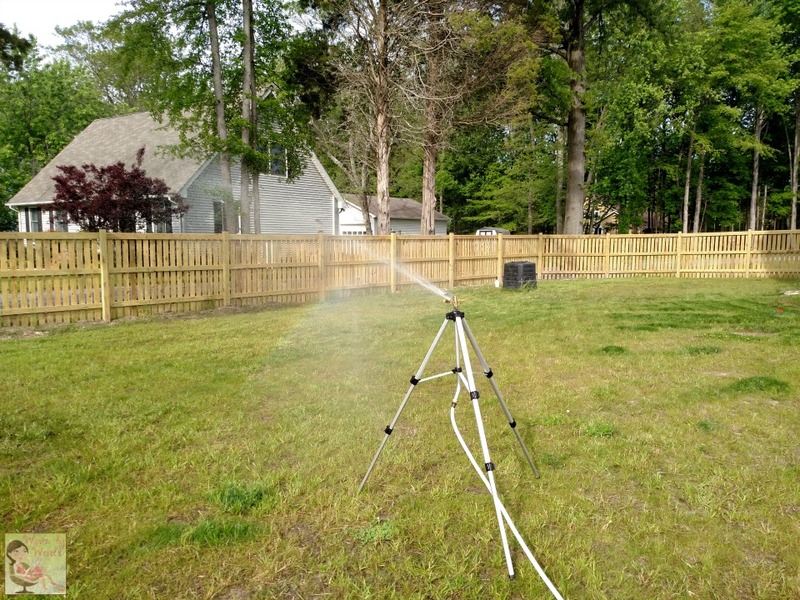 It's definitely a more efficient way to get water to your lawn. I'm surprised at how compact it is too. I FEEL YOUR PAIN! We have hard clay also. It makes landscaping and gardening such a bear. I just may look into this sprinkler for our vegetable garden. I totally feel you on the outdoor reviews with the rain. I think it rained every day here in the month of May. I know I heard we had a record amount of rainfall. This looks like a really powerful sprinkler! Such an easy way to water and keep up on landscaping! I need this for my front yard. My sprinklers aren't working properly, some of them won't come up and some when they do, they don't spin at all, so some of my grass gets water and some doesn't. It's really frustrating. This would be perfect. Best sprinkler ever! I love the tripod - it's much easier on the back and shoulders. this looks so cool! I need this for the same reason, ground is super clay soil here in So Cal. I don't have a big grassy area in the back so this would be perfect. I really like the Metal Pulsating Sprinkler with Tripod -- much better than an on the ground sprinkler. This is pretty awesome! 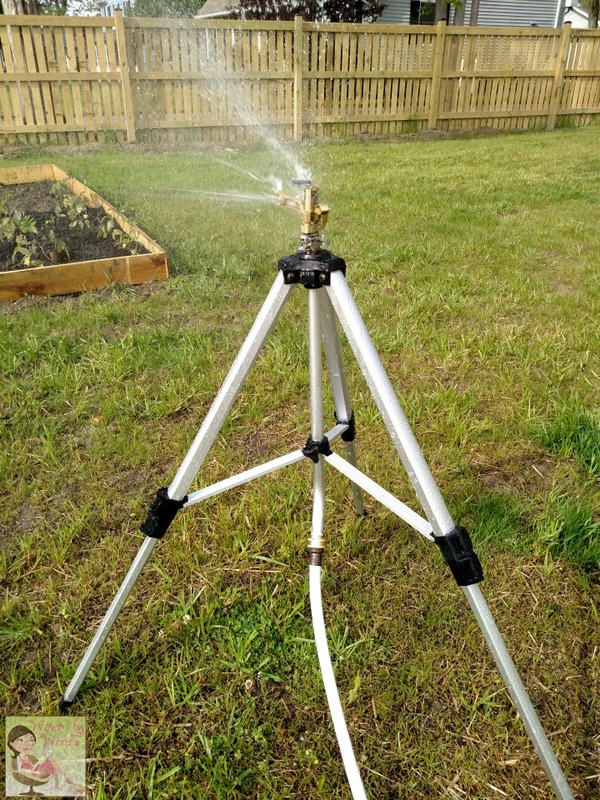 I have never seen a tripod sprinkler before. Like you said, the water now hits areas that a ground sprinkler wouldn't. Very interesting. I love this sprinkler system. I love how it is off the ground so it will cover more of an area. I have never seen one of these. It would definitely be helpful in my garden this summer. 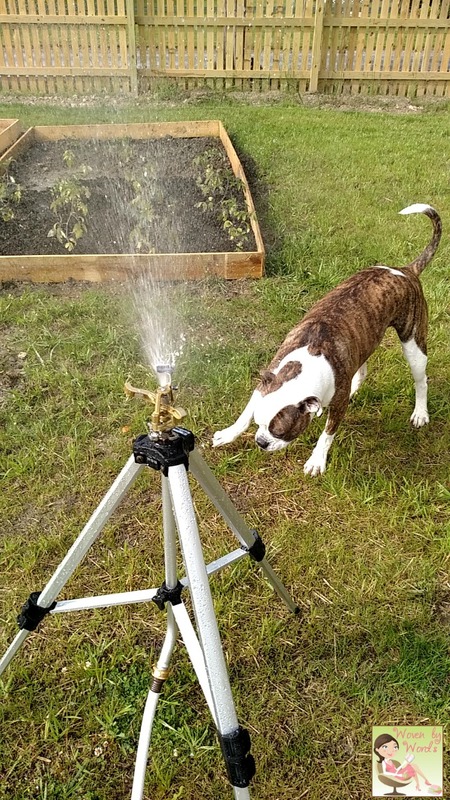 I love the photo of your dog and sprinkler! Too cute. I could use this for sure in my large yard. We just had a new tree planted and it needs a lot of watering. Iam a gardener and could see this easily in the middle of the garden. It would solve alot of problems hooking and unhooking the hose to water. I like it is on a tripod, so you can really get the water where you want. This is a nifty little device. 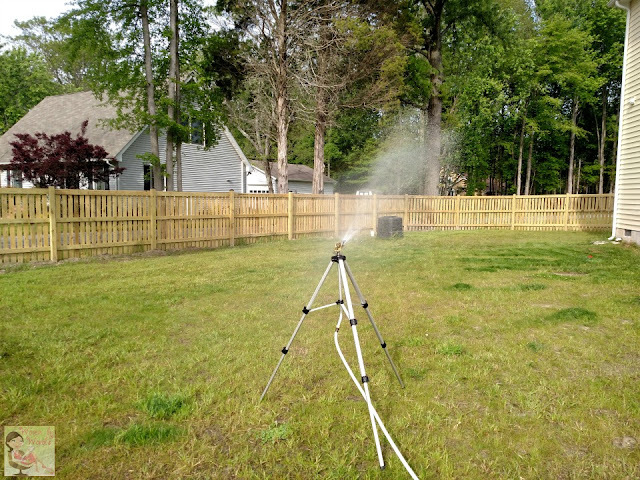 What a great sprinkler system that looks sturdy and effective as it can cover such a large area. I love that it is up on a tripod. What a great sprinkler. My husband has a pretty big garden and he would love having one of these to water it. This loos like a great product which perfectly meets your needs. YOu can get a spray or a mist exactly where you want it to be and not worry about an in ground sprinkler messing up. Sometimes it get dry around here and we need to water. I like the tripod lifting it up for better coverage.